John Tate's (Josh Hartnett) Permission Slip from the 1998 Steve Miner horror sequel, Halloween: H20. In the film, 20 years have passed since Laurie Strode (Jamie Lee Curtis) was haunted by her psychopathic brother, Michael Myers. Now living under the alias Keri Tate, Laurie must protect her son John when Michael Myers emerges once again. 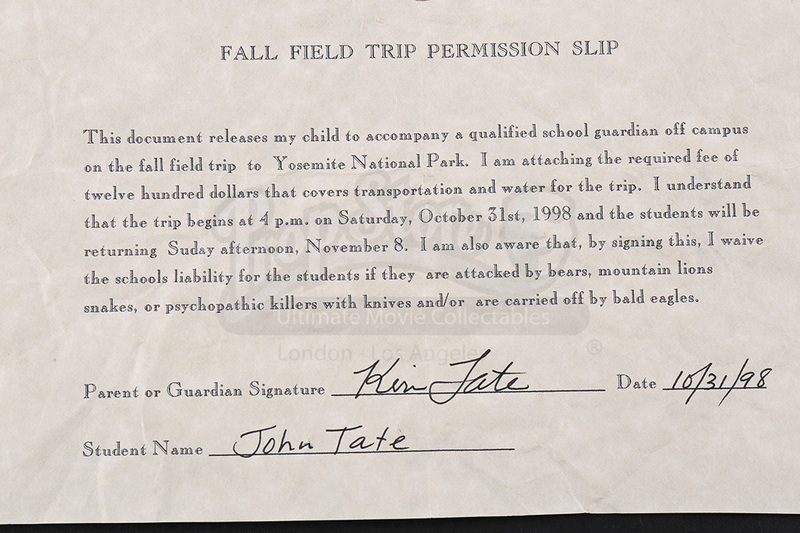 This permission slip was made for the scene in which Laurie/Teri gives her son permission to attend a camping trip at Yosemite National Park. Unbeknownst to his mother, John has other plans for Halloween and decides against joining his classmates on the trip. 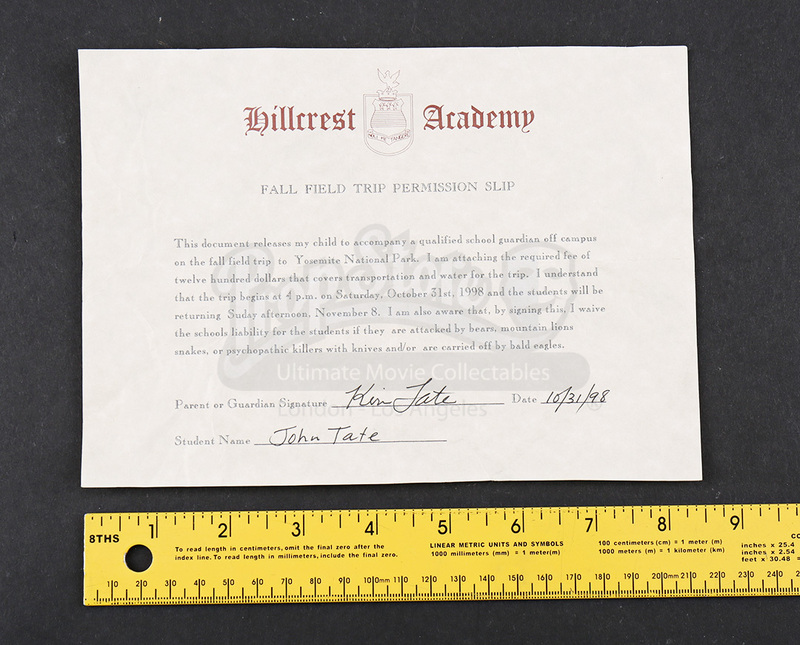 This slip is printed on off-white parchment paper and features the Hillcrest Academy emblem at the top, along with a humorous blurb of text waiving the school's liability in the event of "attack by bears, mountain lions, snakes, or psychopathic killers with knives." This sheet of paper includes the names Keri Tate and John Tate, as well as the date: 10/31/98, all written in black ink. 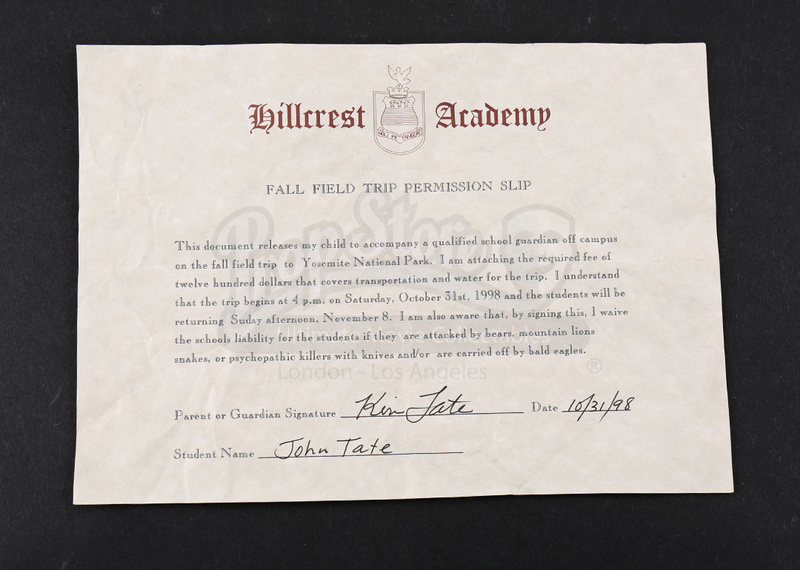 The paper features some noticeable wear from production use as it is crumpled during the scene by John who decides against going on the trip. This prop measures approximately 8.5" x 6" and is in overall good production used condition.